About two months ago, a cousin of mine passed away from liver cancer. She didn’t even last two months after her diagnosis. She is not the first person in my family to be touched by cancer. We’ve got it all in our family, on both sides. As it often is when someone dies, I felt helpless. I wanted to do something. Soon after this all happened we had a garage sale. 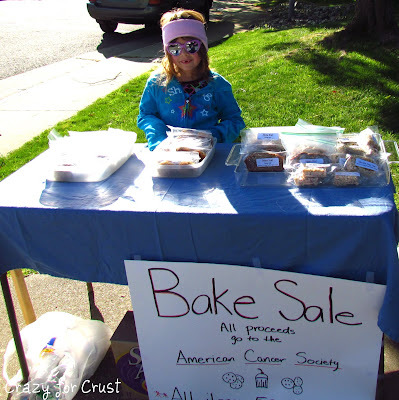 I decided to incorporate a bake sale and donate the proceeds to the American Cancer Society. I had been wanting to do something like this for awhile; to show Jordan how it feels good to give. It just seemed right. 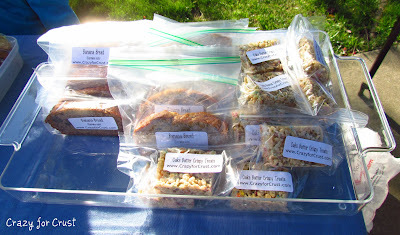 So I made a few goodies, priced them all at fifty cents each, and set up a table in our driveway. We sold out after only a few hours. Jordan was great. She stood behind the table (all bundled up; it was freezing that morning) and asked everyone who ventured into our yard if they wanted to buy a goodie. I think her exact words were “bake sale for cancer!” or something like that. Many people just donated money or told me to “keep the change” from their dollar. I wrapped each item individually in snack-sized Ziploc baggies. I felt it was more sanitary. I stuck with cookies and bars since we were outdoors. I labeled each item individually and when it was necessary, indicated that there were nuts in the item. We ended up making $42 which we were able to donate to the American Cancer Society in my cousin’s name. It was totally worth the work. I will be doing this again, for sure! I hope you enjoy your bake sale experience as much as I did! 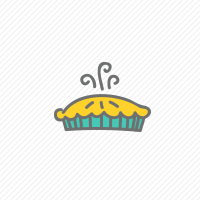 Speaking of bake sales, Ashton of Something Swanky, a blog I really enjoy, has decided to host her own bake sale. She asked a few bloggers she reads to help her by giving her a recipe she could make for her own sale. Her sale is this weekend, and she plans to blog about it (of course, we are food bloggers, after all!) I submitted my Oatmeal Cookie Brownies for her to use. They were a huge hit at my sale. If you want to check out another awesome blog, be sure to stop by her site. What a lovely way to express your love and to honor your cousin. Thanks for these great tips. I am on a Relay for Life team and we’ve had a few bake sales…every new idea is welcome. You are teaching Jordan such a great lesson about compassion. Nothing is better than a good, old-fashioned bake sale. What an adorable little seller you have.